Urgent Chrome Update is the PUP that uses misleading techniques to prevent removal. Use Reimage to locate malicious components and get rid of them faster than with uninstall instructions. A full system scan blocks virus reappearance and prevents traffic to malicious domains. Urgent Chrome Update is a fake alerts which is initiated by adware. It prompts users to execute a .bat file which can bring to many more serious infections. 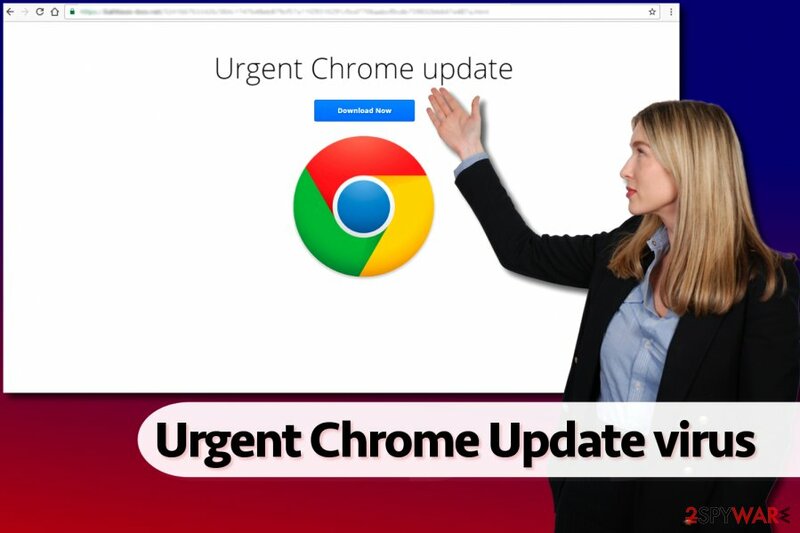 Urgent Chrome Update is a bogus pop-up message that is usually initiated by the adware program installed on the computer. The fake alert might appear on Google Chrome, Internet Explorer, Mozilla Firefox, or Safari at any time during browsing sessions and urge users to download a questionable file, in either .bat, .zip, .vbs or .hta file types. If extracted, Urgent Chrome Update virus either installs adware or even malware on the computer. Additionally, the PUP is known to display pop-ups, blinking windows, and redirect users to phishing and malware-ridden sites. Adware usually gets installed together with free software downloaded from the internet. Unfortunately, freeware and shareware developers often fail to adequately disclose a full list of applications and users proceed without realizing that optional components are also included together with the desired program. Consequently, they end up obtaining Urgent Chrome Update virus, or similar. 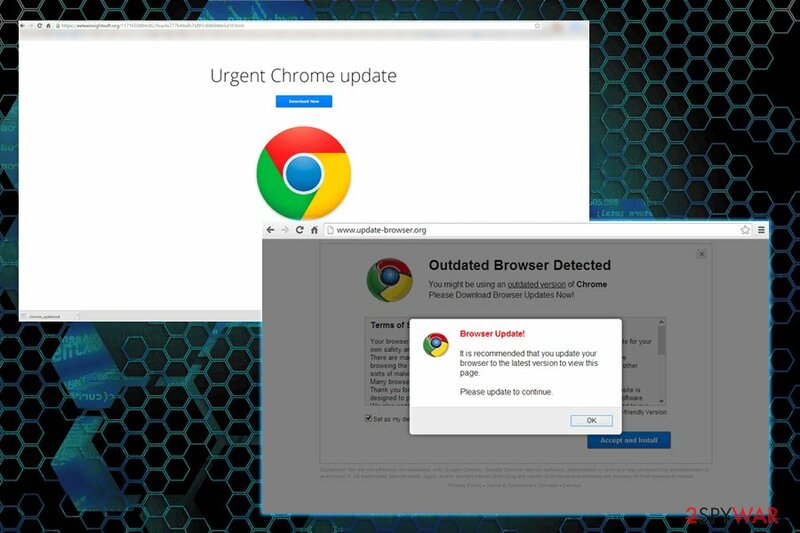 Urgent Chrome Update is a part of Chrome virus and one of many hoaxes created by using the renowned name. For example Chrome Security Warning, Critical Chrome Update, and similar. All of these scams have one common goal: to make users download useless applications or install malicious software to gain profit. Urgent Chrome Update authors try to delude users by creating fake update notifications and urge them to install highly questionable software or browser extensions/add-ons. Also, they apply pressure to leave as less time as possible for users to think. However, once you encounter such update messages, you need to identify whether they are real or caused by adware or malware. In this article, we will help you to do that. You will also get acquainted with methods used to remove Urgent Chrome Update virus. Previously, there were already attempts from scammers to mislead users with a fake browser, missing browser font or operating system notifications. Likewise, Chrome has been targeted again. The primary goal of such deception is to convince you to download additional applications. The latter might be only futile or malignant programs. Therefore, once unknown elements are installed, you might experience other issues related to browsing or system applications. After a while, you might notice the installer installing other questionable tools or, occasionally, causing system error messages. These peculiarities might lead to further highly disturbing outcomes or even computer crash. Therefore, it is crucial to eliminate Urgent Chrome Update ads as soon as possible. You can use Reimage to assist you. Urgent Chrome Update virus usually automatically downloads Chrome-update.bat file, which is highly dangerous. The longer this application stays on the PC, the more Critical Chrome Update pop-ups might pile up on the screen. These commercial offers might also lead you to similar advertising, gaming and gambling web pages. Note that they might be insecure and disguise malware (such as ransomware) within them. Try to cancel the redirect tabs and avoid peeking in such websites despite how intriguing they look. You can differentiate between legitimate and fake browser updates by analyzing the logo. It is often the case that scammers employ modified trademark sign to make you install the malicious Urgent Chrome Update file. According to experts from VirusActivity, the reason why you experience unexpected redirects to highly suspicious websites lies in your computer. You might have installed adware along with a free program that you recently downloaded. If you still find a hard time understanding how the hijack occurred, we will gladly explain it. It is a common fault not to pay enough attention to the installation instructions. Scammers are aware of this and pin down their unwanted applications confident that they will successfully get into the computer. Usually, they are attached to “Basic/Default/Standard/Recommended” settings. After choosing the latter and leaving the add-on pre-checked enable the adware to enter the device without any obstacles. To prevent adware or other potentially unwanted programs from compromising your PC, choose Custom or Advanced settings for software installation. These will provide you with a chance to decompose the software pack. Finally, let us proceed to Urgent Chrome Update removal section. While the redirects to scam sites are initiated by adware, the .bat file downloaded from one of such sites can install data-stealing malware and compromise online safety. It is not difficult to remove Urgent Chrome Update virus. You can do it manually and automatically. The manual guide can be found below on this page. Carefully go through each stage to ensure that the adware is completely eliminated. This PUP might employ additional files, and they might be scattered across the entire registry. That is why locating them the usual way may turn out to be a tiresome activity. Automatic Urgent Chrome Update removal might be a better option. Install the anti-spyware application and make sure it is updated. You can also decrease the risk of virus infection by carefully performing the installation of the new application. In general, cautiousness and proper cyber protection will not only save you from Urgent Chrome Update virus but from more serious threats as well. To delete Chrome Update pop-up virus, you need to delete all programs that were installed without your knowledge. Before you do this, we suggest removing the chrome-update.bat file. You can track it down by looking at Chrome's Downloads and clicking on “Show in Folder” button. Once you complete this task, follow the steps provided below. Here, look for Urgent Chrome Update or any other recently installed suspicious programs. Wait until you see Applications folder and look for Urgent Chrome Update or any other suspicious programs on it. Now right click on every of such entries and select Move to Trash. When in the new window, check Delete personal settings and select Reset again to complete Urgent Chrome Update removal. Once these steps are finished, Urgent Chrome Update should be removed from your Microsoft Edge browser. Here, select Urgent Chrome Update and other questionable plugins. Click Remove to delete these entries. Now you will see Reset Firefox to its default state message with Reset Firefox button. Click this button for several times and complete Urgent Chrome Update removal. To remove Urgent Chrome Update from Chrome, you need to complete the following tasks. Here, select Urgent Chrome Update and other malicious plugins and select trash icon to delete these entries. Click Reset to confirm this action and complete Urgent Chrome Update removal. Here, select Extensions and look for Urgent Chrome Update or other suspicious entries. Click on the Uninstall button to get rid each of them. Here, look at the Homepage field. If it was altered by Urgent Chrome Update, remove unwanted link and enter the one that you want to use for your searches. Remember to include the "http://" before typing in the address of the page. Now you will see a detailed dialog window filled with reset options. All of those options are usually checked, but you can specify which of them you want to reset. Click the Reset button to complete Urgent Chrome Update removal process. ^ What is malware and how can we prevent it?. Norton Internet Security Center. Tips, Education & Answers. ^ Mark Jones. Top Story: Google Chrome scam continues to spread! 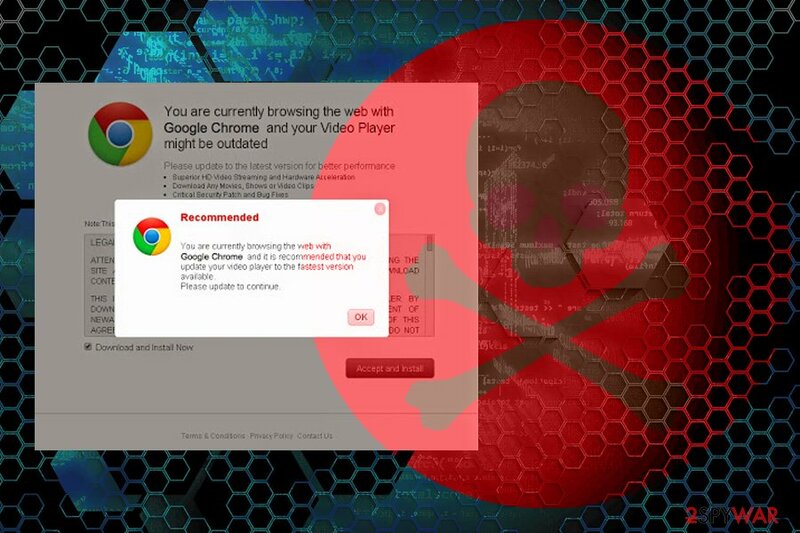 Watch out for this fake pop-up warning. Komando. Tech News, Tips, Security Alerts & Digital Trends. ^ VirusActivity. VirusActivity. The Latest Malware Activity News. 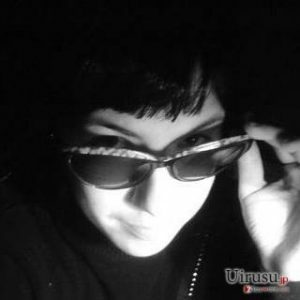 This entry was posted on 2019-04-01 at 07:32 and is filed under Adware, Viruses. You can quickly scan the QR code with your mobile device and have Urgent Chrome Update ads manual removal instructions right in your pocket. How did you remove Urgent Chrome Update ads?